Fort Tarsis, the hub area in BioWare’s upcoming sci-fi MMO Anthem, looked lived-in and realistic in a livestream BioWare held Friday. During the stream, the developers showed off a bit more of Tarsis’ market area, along with the Vault and Forge. Fort Tarsis appears to be an ad-hoc community of traders and mechanics who have set up shop in an ancient stone structure. Archways are full of mechanical gear and tools, while vendors’ brightly-colored tents flutter in the light breeze, soaking up the sun coming down from above the high walls. On either side of the market are two huge sets of scaffolding, which the BioWare team called “strider bays.” One housed a massive legged machine – presumably one of the striders. The livestream, which had to end early due to technical problems, also showed off the Vault, which is where players will access their inventory. 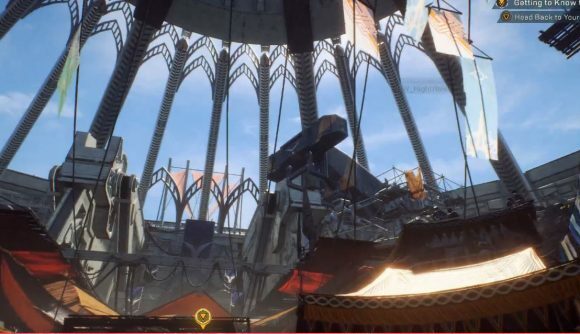 It’s a lot like Destiny 2’s vault, although in Anthem you’ll have your own instance of Fort Tarsis, and so you won’t be accessing your stored items from a social space. Watch Anthem Developer Livestream – Ft. Tarsis Coverage & More with Lead Producer Mike Gamble – #AnthemGame from anthemgame on www.twitch.tvDuring the stream, we also get a look at the dialogue system, which as we’ve learned will give you two options each time you’re prompted to respond during a conversation with an NPC. After a brief exchange with a character named Jones, we meet Zoe, who’s the character in charge of maintaining your Javelin. The livestream didn’t provide much in the way of new information on Anthem, but rather showed off some of the features we’ve already learned about. BioWare will be showing off more as the Anthem release date gets closer. In the meantime, you can sign up for the closed alpha scheduled for next weekend. You’ll have to sign in with your Origin account and set up a community playtesting profile. We’ll be interested to see how BioWare’s spin on the co-op “MMO-lite” shooter turns out, especially after the fun some of us around these parts have had with games like Destiny 2 and the Division.